Far West Recycling to close its Southeast Portland facility the same day it closes its Lake Oswego one. 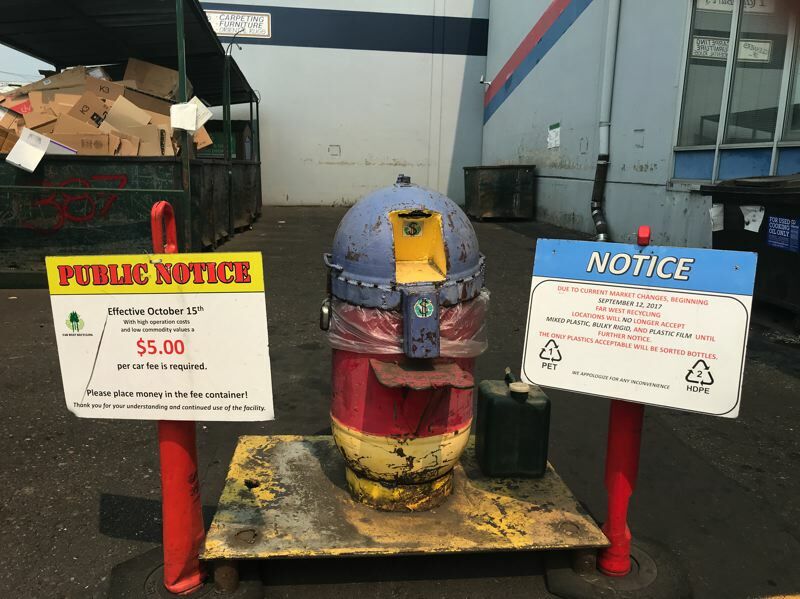 In a sign of the times, Far West Recycling is shutting down its Southeast Portland public recycling depot on Sept. 24, the same day it closes a similar facility in Lake Oswego. "The SE Public Recycling Depot has served the community for many years, but due to higher operational costs, freight rate increases, low commodity prices and high contamination levels we are faced with a very difficult decision to close down our depot," the company relayed on its website. "We appreciate all of the support that we've received in the past to help keep this depot open to the community." Far West has been the largest operator of materials recycling facilities in Oregon, which accept recyclables dropped off by haulers. Then it sorts and bales the recyclables for resale to industries that reuse them. But the crisis in the recycling industry, sparked by China's decision last year to essentially halt buying imported mixed plastics and papers collected at U.S. curbsides, has sent shockwaves through the industry. Whlie some other markets have opened up, China was by far the biggest buyer of mixed paper and plastic scraps, and its new purity standards are considered impossible to meet for curbside programs that allow people to mingle various recyclables in one bin. Far West's SE Public Recycling Depot, located at 4930 S.E. 26th Ave., will close permanently, along with its similar facility in Lake Oswego's Foothills neighborhood. For now, the closures leave Far West with one public recycling depot at its Hillsboro materials recycling facility, as well as two other sorting facilities without such public depots in Northeast Portland and Tualatin. Nonprofits, churches and other groups doing community cleanups had used Far West to bring harder-to-recycle items such as plastics that aren't accepted at the curbside. But since China shut down its imports of our mixed plastics and paper, Far West shrunk the list of plastics it would accept. For several months it has only accepted No. 1 and No. 2 plastic bottles.